All your favourite magazines at great prices. They make great gifts! Get your favourite magazines at the same price or less and Westwood gets 30% of the subscription price. It's a win-win: we raise funds to help with special projects that would not otherwise be possible for Westwood Junior and Senior, you get great magazines and save some money and we all support literacy! Be a part of making great projects possible like the weight room at Junior, the soccer nets at Senior or the fantastic library initiatives we support every year. It's not only a great cause, it's fun too! Visit www.qsp.ca, click on Shop Now and enter Westwood code #3741311. Order now and magazines will come in time for holiday gifts. This is the place to do all your Holiday shopping - there's something for family, friends, hostess gifts, co-worker gifts, and birthday gifts too. You'll find a wide array of crafts and gifts making it easy to find a little something for everyone. Stop for lunch at the Westwood café and buy an arm's length of raffle tickets to win the basket of your choice , courtesy of our community's super merchants (we usually have about 75 baskets in addition to our grand prizes). Don't forget to load up on books with the Westwood Junior and Senior library sale - stock up on a winter's worth of great reading. 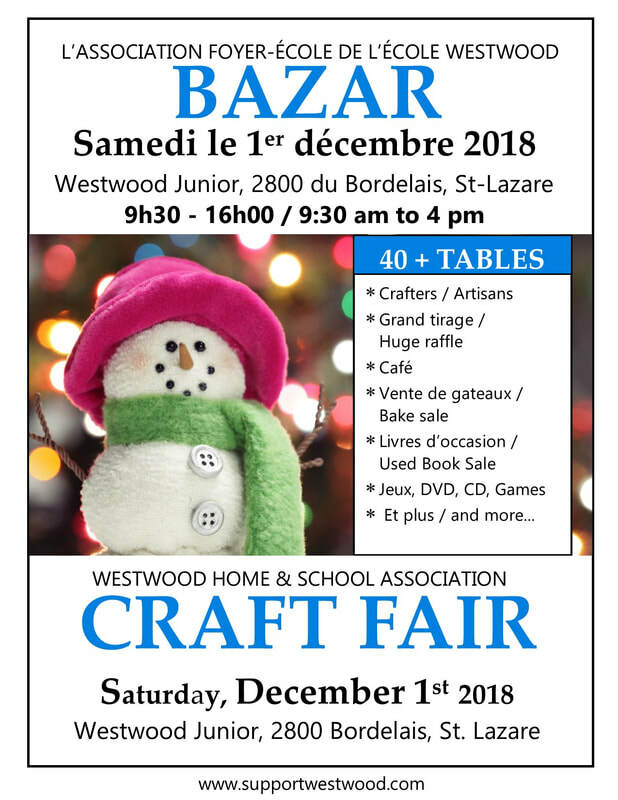 It's all happening at Westwood Junior, 2800 du Bordelais, St. Lazare, J7T 3E3 on Saturday, December 1st 2018, 19:30 am to 4 pm. 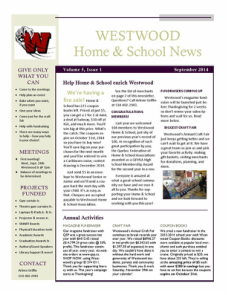 Members stay informed with the Westwood Home & School News. Your $20 membership allows Westwood Home & School to keep working for the students of Westwood Junior and Senior High Schools. We need at least 10% of families to keep our Home & School designation every year. Being a Westwood Home & School member means that you can be proud of the scoreboard and gym curtain at Junior and the soccer nets and drinking water fountains at Senior. It's about the Wrestling team that we helped get to the championships in the Maritimes and the students we helped to send to the model UN. Membership and fundraising help to bring in great authors, guest speakers and inspiring role models. It all starts with your membership in Westwood Home & School. Are fundraisers getting you down? Then how about making a donation to Westwood Home & School instead? If you don't need more stuff but you'd like to be a part of helping to make great projects happen at Westwood Junior & Senior campuses, consider making a donation online. It's fast, easy and helps Westwood Home & School reach its target of $12,000. Visit our Donations page to see how.